Next Video Google showed the Daydream View VR headset! Soon the PlayStation VR will arrive at the door of first early adaptors who have placed a pre-order. 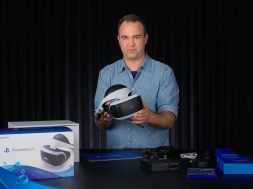 In an official unboxing video from Sony Sid Shuman shows what’s included with the PlayStation VR. Besides the VR headset you receive the PlayStation VR processing unit. Attached to the headset is a small remote with a headphone connection, in-ear headphones are supplied with the headset as well. There are various HDMI and USB cables included to connect it all to your PS4. The first customers can expect their pre-ordered PlayStation VR on October 13. I will keep you posted on all the latest games, do an unplacking myself and share all the cool stuff you need to know. Don’t forget to check out my YouTube-channel www.classicgamer.nl! next Google showed the Daydream View VR headset!